Tamper Proof Hex bolts and pin hex security screws have a wide range of uses and are popular where high torque or use of power screwdrivers is needed. 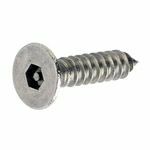 They require a matching Security Hex Driver Tool (or driver bit) to install and remove, but are another great anti tamper screw available from Insight Security for next day delivery. Security Hex screws are also often referred to as Pin Hex or Tamper Proof Hex screws. 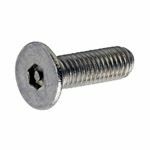 These tamperproof screws have a wide range of uses and are popular where high torque or use of power drivers to install them is needed. Pin-Hex screws are "Two-way" screws, which means that like Security Torx Screws, they can if required, be removed at some future date after installation. They do however require a special matching security driver tool to install or remove them, as the special security pin embedded in the drive socket of the screw head, makes it impossible to use them with a standard Hex Allen Key or standard Hex Screwdriver. The stock product range is manufactured from A2 grade stainless steel which means that the screws can be used for safety or security applications either indoors or outdoors. Subject to minimum order quantities and manufacturing lead-time however, pinhex screws can also be supplied in an alternative material and finish such as a standard steel screw with a BZP (Bright Zinc Plated) finish (call Insight Security if you would like a quote for special manufacture product: 01273 475500). 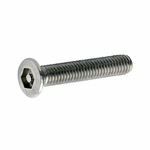 Pin Hex screws are available as self tapping screws with AB type Self Tapping Threads, or as metric machine screws. Either type can be supplied with a Button or Countersunk Head, whilst the Machine Screws are also available as 3.5mm Electrical Screws (in lengths up to 60mm), with a raised contersunk head. (see Security Hex Security Driver selection table for details of the full range of options available).